A scene from the final day of the Fair! The arch was promoting the James Bond "Super-Car" from "Goldfinger". There were a few typos - I think the system was wearing out! We'll get a look at the other side of the arch soon! Amazing. The very next day, the arch would be irrelevant and waiting to be removed. Another view of General Foods Arch #11 on the last day of the Fair. Right till the very end it appears it was business as usual. Bill, your picture first picture is also a great view of the night lighting for the Water Ski show at the Aquacade. First time I've seen it, I think. But I had seen in some daytime pics that they hung those lights in a big mesh net and then stretched it across the Aquacade wall. I'm curious whether the lighting was animated. Good question. Unless we find a movie or another picture to compare patterns we can only guess - and my guess would be yes. are you able to zoom in to each of the ads on the arch? They're awesome. What coffee was it advertising? Maxwell House was one of the products owned by General Foods, which sponsored the arches. Others of their products which appeared in the Arch ads included Birds Eye frozen vegetables (or was it Green Giant ho ho ho?) and a new product with Space Program tie-ins- Tang. Maxwell House also had a presence in the Better Living Center. By the way, I think they switched from black & white to color ads on the arches in '65. See Yourself on Color TV! Interests:NYWF 1964/65. RCA Pavilion, and all the big industrial pavilions, especially Disney-created, including Illinois; Bel-Gem Waffles! This article on nywf64.com, from INDUSTRIAL PHOTOGRAPHY, Vol. 13, No. 5, May 1964, says each photo tape contained four color and six black and white shots. At least, that must be what was planned. I have no idea why they wouldn't use all color. 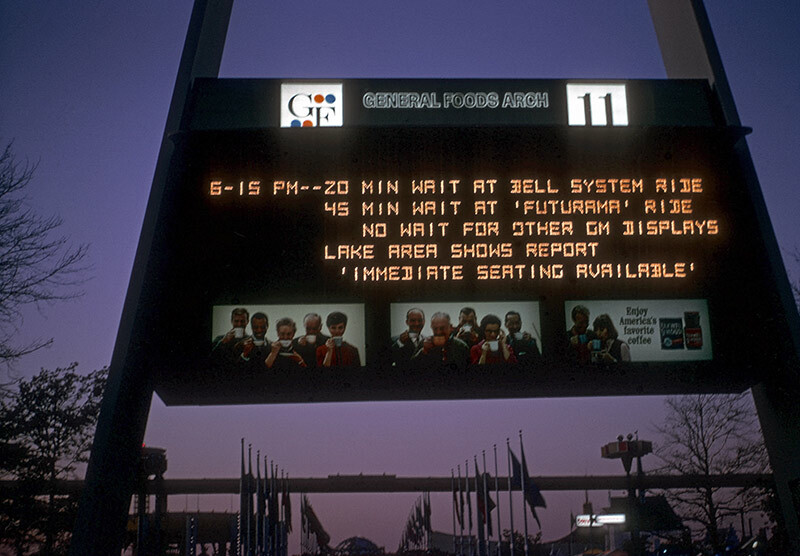 The material was "DuPont Cronar photo-sensitized polyester" and the prints were translucent, visible by reflected light during the day and backlight at night. The photo-sensitized part doesn't make sense to me for color, as it would have been a very unique process, whereas a single color (black or blue or whatever) could be done easily by a blueprint type of photosensitive process. The article says the tapes were produced by Color Corporation of Tampa. Here's a current reference to DuPont Cronar polyester film base. While it can be used as a base for a regular photographic silver-dye process, I'd bet that the images were printed on using special inks to get the proper results for both reflective and backlit conditions. Bill, I suspect I've made a mistake. Your first picture indicates that Bond's auto was on display at the AMF station. I was under the impression it was at Continental Park, per my post of July 30 ("A Glance at Continental Park"). Referring to that post, the man in the auto in picture one has a red jacket of some kind--an AMF color. In picture two, there are suspicious red and white stairs in the background, more AMF color, and a stair a that. Possibly to get to the trains. Curiously, though, of the 30+ AMF photos I have gleaned from the Community site, none make any reference to James Bond's car, nor does the Guide Book. I've made mistakes before, and this might be the latest. Standing by to edit as necessary. 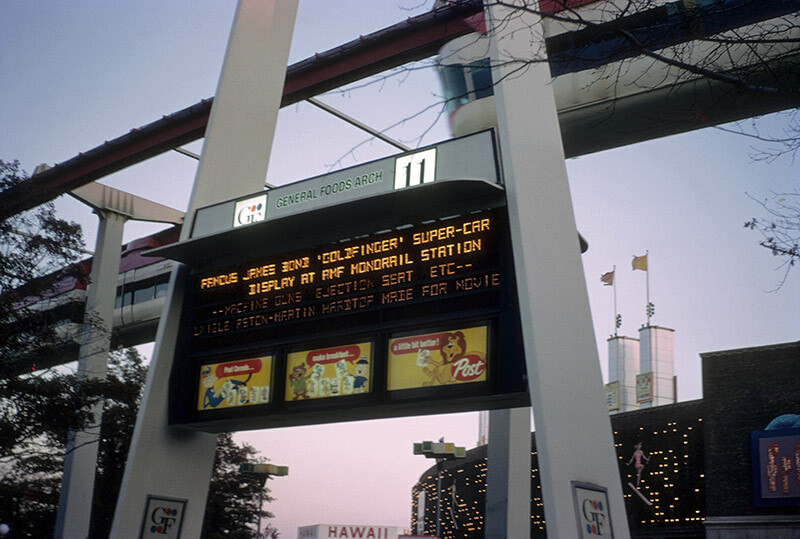 Yes, Ralph, the "Goldfinger" car was at the AMF station.